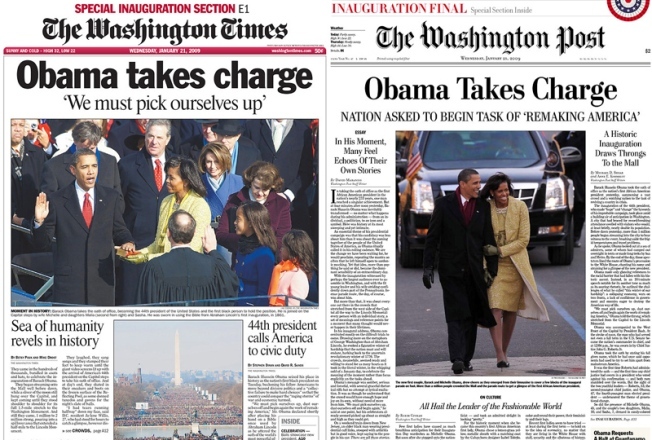 Some editions of both The Washington Post and The Washington Times, arch-rivals in the city that is a veritable news machine, carried identical headlines proclaiming: "Obama Takes Charge." WASHINGTON -- Newspapers are in trouble? Says who? You couldn't tell it by the long line of people at a Hudson News Store at Washington's Union Station Wednesday morning. Large numbers of people queued up at the train station to buy multiple copies of newspapers, seeking souvenir front pages trumpeting Barack Obama's inauguration as president.